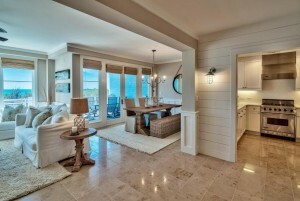 Gorgeous gulf front condo in Watersound Beach, FL! Located south of 30A in the gated community of Watersound Beach this fully renovated gulf front condo features 3 bedrooms, 3 1/2 bathrooms, first floor master, panoramic gulf views, quartz countertops, custom backsplash, and 2,126 sq. ft. of heated and cooled space. The community of Watersound Beach is just west of Rosemary and Alys Beach and offers several community pools, an outdoor grilling area, parks, green spaces, a private beach, and so much more. Conact one of our agents today to see this or any Watersound Beach condos for sale. Contact us at The Beach group at 850.231.9007 for more information on Watersound Beach real estate.